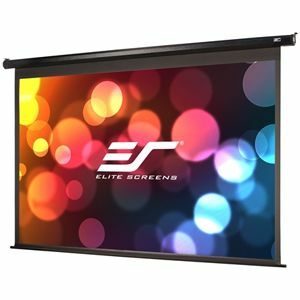 Elite Screens Spectrum Series 125" Projection Screen is suitable for most applications from commercial presentations to home cinema. 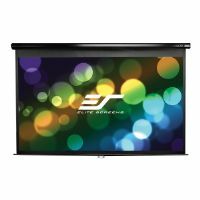 This projection screen has 160 degree wide viewing angle with 1.1 gain for all application in home cinema or business presentation. The Spectrum Series has 4 inches of top masking to complement the side and bottom borders. This provides a professional effect by properly framing your projected image. Maxwhite screen material is durable and easy to clean. Black backed screen material eliminates light penetration for superior color reproduction while black masking enhances picture contrast. It has built-in 12 volt trigger enables synchronized control through the projector for professional installation. The synchronized motor is quiet, has a low power consumption and operational longevity. For added durability and enhanced product appearance, the Elite Spectrum Series uses an all-steel casing construction including the end caps. It is designed for both wall and ceiling installation. 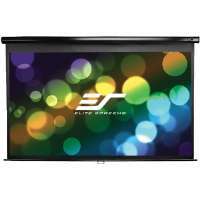 Buy the Elite Screens Spectrum Series 125" Projection Screen today!